A team from Stanford’s MobiSocial lab has developed two applications for the Google Nexus S that use NFC’s peer-to-peer capabilty: A phone-to-phone file transfer service and a collaborative whiteboard. Researchers at Stanford University’s MobiSocial lab have found a way to unlock Android’s NFC peer-to-peer capabilities and have developed two P2P NFC applications, a phone-to-phone file transfer service and a ‘collaborative whiteboard’. As it turns out, P2P mode wasn’t completely ignored in the Gingerbread cycle. After looking through some of the commits for Gingerbread (long live open source! ), we found an initial implementation of P2P in Android. And, with a bit of work, we were able to run P2P mode successfully between our two devices. 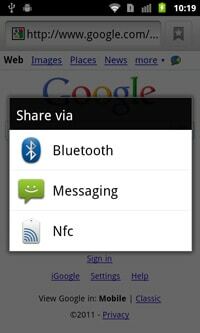 The initial implementation was called MyTag, and allowed a phone to present an NFC tag to another phone. Note that although NFC has a mode for “card emulation”, this implementation uses a true P2P connection to send a tag between phones, with a socket established between the MyTagServer and MyTagClient. “The URL contains enough information to tell the joining device (a) which application is being used, and (b) which application session to join,” says the team. The demonstrations have been developed using the team’s own custom NFC API and they point out that running the demonstrations currently requires a custom build of the Android OS. The team also make use of the Junction platform, also developed at the MobiSocial lab, which allows an application to be run across phones even if a joining phone doesn’t yet have the application being used. Junction applications are multiparty, enabling several phones to be joined together by simply touching one interested party to any device that’s already in the session. Full details on the project are available on the Stanford Mobile and Social Computing Research Group’s MobiSocial lab blog.